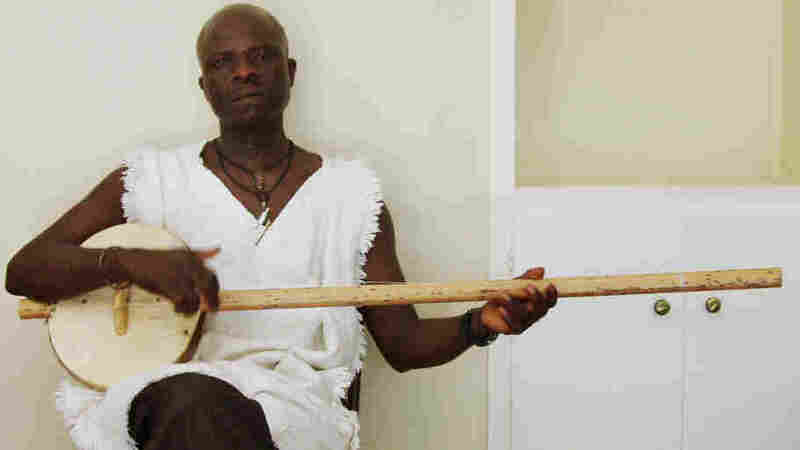 The Banjo's Roots, Reconsidered Research by a Gambian musician has shed new light on the African origins of a quintessentially American instrument. Laemouahuma Daniel Jatta plays the akonting, an African instrument that may be a precursor to the banjo. "My father was born with this instrument," Laemouahuma Daniel Jatta says. "This is part of our history." Jatta, 55, is from Gambia, a member of the Jola people. He's holding an akonting: a three-stringed instrument with a long neck and a body made from a calabash gourd with a goat skin stretched over it. Jatta's father and cousins played the instrument, but he didn't think much about it himself until 1974, when he was visiting the U.S. from Gambia, attending a junior college in South Carolina. He recalls watching a football game on TV with some of the other students. "When the football ended, there was this music program from Tennessee, and they called it country music," Jatta says. "I watched the program and saw the modern banjo being used. And the sound just sounded like my father's akonting." That experience put Jatta on a journey to explore the banjo's connections with the instrument he grew up with. The banjo came to America with the slaves, and musicologists have long looked in West Africa for its predecessors. Much of the speculation has centered on the ngoni and the xalam, two hide-covered stringed instruments from West Africa that bear some resemblance to the banjo. But they're just two of more than 60 similar plucked stringed instruments found in the region. Jatta plays an akonting tune written by his father. Over the next two decades, while he pursued undergraduate and graduate degrees in the U.S., Jatta learned everything he could about the origins of the banjo. Eventually, he reached a conclusion. "Among all the instruments ever mentioned as a prototype of the banjo from the African region," he says, "the akonting to me has more similarities, more objective similarities than any other that has ever been mentioned." For one thing, the akonting looks like a banjo. It has a long neck that, like those of early banjos, extends through the instrument's gourd body. It has a movable wooden bridge that, as in banjos, holds the strings over the skin head. But for Jatta and other banjo scholars, most convincing is how the akonting is played. Players use the index finger to strike down on one of the long strings, and the thumb sounds the akonting's short string as the hand moves back upward. When Jatta looked at early banjo instruction books from the mid-1800s, he found that they described an almost identical playing style. "What struck me was when they mentioned the ball of the thumb and the nail of the index or middle finger, I knew straight away my father was using this same style," Jatta says. "This was never a surprise to me, because I have seen this since I was 5 years old." That early style of playing predates the three-finger style used today by nearly all bluegrass banjo players. Something similar is still used by folk and country musicians who play in a style sometimes called frailing or clawhammer. After doing 10 years of research supported by a Swedish university, in 2000, Jatta presented his findings first in Stockholm, and then a few months later at a banjo collectors' convention in Boston. Greg Adams is a banjoist and graduate student in ethnomusicology at the University of Maryland; he says Jatta's findings on the akonting have forced many scholars to rethink their assumptions about where to look for information on the banjo's ancestors. "A lot of the emphasis up to that point was focused on griot traditions, which is extremely important as part of the conversation as we look to West Africa," Adams says. "But what the akonting did was open up a new line of discourse." The ngoni and xalam are instruments typically played by griots — praise singers who enjoy special status in many West African tribes. Adams says the akonting is a folk instrument, played not by griots, but by ordinary people in the Jola tribe. In terms of which tradition has the most direct connection to the banjo, Adams says it's a mistake to think of it as an either/or proposition: "Each of these traditions deserves to be explored, experienced, examined on their own terms." Jatta plans to continue his work, documenting the akonting musical tradition and its connections to the banjo and other areas of Jola culture, through a research and education center he's founding back home in Gambia.